SUBSCRIBE to DNAcademy on YouTube! When I ask you who you think the most successful domain name investors of all time are, who comes to mind? Likely this list includes Frank Schilling, Kevin Ham, Yun Ye, Gary Chernoff, Scott Day, Rick Schwartz, Mike Berkens, Andrew Rosener and Mike Mann. And what sets them apart from the pack? They’re not worried about maximizing the cash they can take home this year. Yes, they need some level of cash to live on, to pay the bills, to pay the mortgage, to pay their staff, to invest in their company. But they understand that they if they can keep their premium domain names longer, that they will receive capital appreciation that will benefit them in the long term. They understand that saying no to the $100,000 offer toady, by saying no to the $500,000 offer tomorrow, and by saying no to the $1 million offer next month will lead them to the $3 million sale they know their domain name is worth. And, yes, I know we don’t all have names in that valuation range. Scale it down. Saying no to the $1,000 offer today, no to the $5,000 tomorrow, no to the $10,000 offer next month will lead to the $30,000 sale your domain name is worth. Now I’m not talking about day trading. There are domain name investors that play the short game, and buy numerics, acronyms and other domain names with liquid value, looking for the trends, and playing the daily or monthly arbitrage game. More power to you. But the big money is in the long game. Look at the companies that play the long game. Google, when they went public, shocked Wall Street by telling them they were not going to be giving quarterly earnings guidance because they expect their shareholders to understand they’re in business for the long-game. Jeff Bezos of Amazon has been hailed as the “prophet of no profit.” Bezos has always played the long game, minimizing or eliminating profits by reinvesting it in business growth, because the vision was always to create the largest retailer in the world, not just the largest bookstore. Short-term thinking can produce good profits today, but loses the long-term game. 99% of investors are playing the short term game. But the 1% with talent, the 1% that understands how to play long game — they’re going to win every time. Like this content? Good! But note, we do not accept advertising nor recommend affiliate products to fund this type of research or article. Please consider helping us write more by buying us a coffee, supporting our monthly brew, or signing up at DNAcademy where you can ask any support questions you want in our private "no dumb questions" discussion forum. This philosophy sounds like Warren Buffett’s who when asked what his preferred holding duration was, replied “forever” and I think I remember reading that he still has the Coca Cola shares he bought in maybe the 60s or whenever. I don’t know Thunayan Khalid al-Ghanim and I’m not sure what their investment strategy is, so I cannot speak to including him on the list, but I appreciate you bringing his name up so I can look for an opportunity to either have him on a show or meet him personally. Thanks for watching and posting your feedback. It’s appreciated. Domain investing always seems like a good plan, great video Michael. I believe that said investors are at a stage in their lives that can turn down such offers, but take an investor in their early years, of course you can negotiate, but it’s harder to decline. I’m learning to decline/negotiate more of some of my names and others I’ll flip. Building as I go. Thanks for your time Michael, all the best. Great points you bring up. When you’re a newer investor you definitely need some wins under your belt, period. We have domain name investors in DNAcademy who have purchased domain names for $8.88 (hand registration) and later sold them for around $500. And just yesterday, a DNA student sold a domain for $6,000 that he purchased for around $700. I’m ecstatic when I hear stories like these. Not every domain name is worth a million dollars. But accepting $1,000 when you know your domain name is worth between $5,000 and $10,000 is not good investing. That’s when you play the long game. Thanks for taking the time to post a comment and discuss flipping versus selling. As an end user it’s always a challenge to find affordable keyword domains in my industry when more and more sellers use listing brokers; which limits my ability to get the price low enough and still allow margin for broker commissions and a reasonable return for the seller. I find sellers want to sell but fees seem to get in the way of closing deals vs. dealing direct with seller. You, as the buyer, have a ton of leverage. 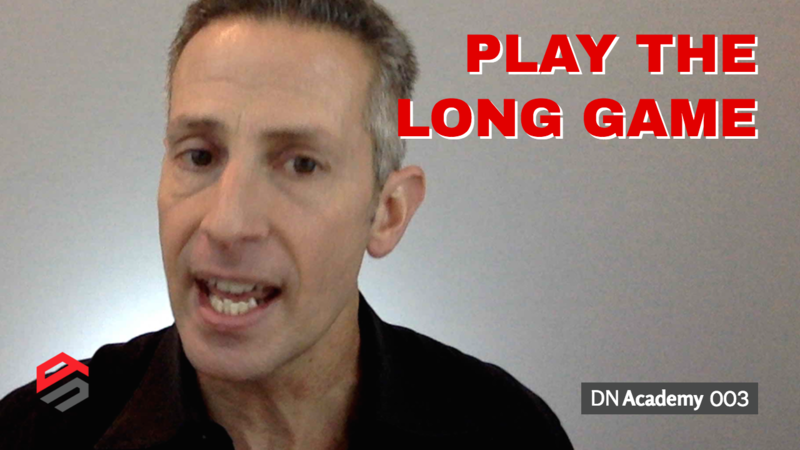 You, too, can play the long game and wait for opportunity to come to you. For example, if you identify a domain name you want and cannot come to an agreement on the price with the seller, reach out to them periodically to see if they’ve changed their mind. Life happens, people need quick money for health bills, holidays, tax bills — or sometimes they just change their investing focus and want to liquidate. Patience can sometimes pay off. Alternatively, you can negotiate. You would likely pay the asking price of a house if you really wanted it and there were a few other offers. But if there were no other offers on the house, wouldn’t you negotiate? You bet. And trust me, sellers expect you to negotiate. Fees are usually less of an issue than the final sales price, in my opinion. Most brokers charge 15%, but many only charge 10%. And like real estate professionals, they are willing to lower their fee to get a deal done, if you ask and make it a condition of the sale. In addition, most brokers only take names that are worth $50,000 or more, as it’s not worth it to them represent a name worth less given that the same amount of work will go into marketing, negotiating and selling the name. Finally, if you still think the broker fee is not allowing the sale to go through, simply ask the seller when the broker exclusivity on the domain expires. Then contact them again. If it’s still available at that time, you can begin negotiations. Offering to pay those fees (in part) can reduce the friction on deals. If you’re in it for the long term, brokers are integral to your success. If you’re willing to wait and willing to risk the domain being sold to someone else, then there is a potential upside. Don’t misinterpret my comment. I’m by no means saying going around brokers and not paying brokerage fees that are due. But if the original poster wanted a comprehensive answer to his question, then that is one of the options. If you believe in the domain names, keep the faith. Rick Schwartz has held names for 20+ years in order to wait for the right buyer with the highest and best use case for his domain names. I got 3 domain requests (1st in 2015, 2nd and 3rd in 2016) through Godaddy’s “DomainBuy” service for the same domain name, which i believe the potential buyer need to pay about $50 for the service. Not sure whether all the three requests came from the same person or different though but the Godaddy broker said they are endusers. The domain is related to “gas” (with .com) . Do you think I should have accepted their offer or just wait and see? It is not a keyword domain but more of a brandable name. The exact name has so many tld version like in co.za, co.uk, co.nz, com.au but all are not from the same company i guess. You have to say ‘no’ over and over again to get the price you want. How did Rick Schwartz sell 997.com in late 2016 for $688,888.88? He said ‘no’ to $100,000. He said ‘no’ to $300,000. He likely said ‘no’ to $500,000. The key is understanding what your domain name is worth to an end user (or in this case, a Chinese investor). I do not know what your domain name is, so I cannot speak intelligently about whether the value is $2,000, $6,000 or $1,000. If the value is $1,000, you should have taken the offer. If the value is more than $1,000 and you are in no rush to sell the domain name, then you should wait. I have domain names that are worth far more than the offers I’m receiving. I enjoy receiving offers, and know one day the perfect buyer with the “highest and best use case” for a domain name I own will come along. If you’re not a DNAcademy student but enjoy our blog, consider buying us a cup of coffee! Is GoDaddy’s Domain Discount Club Financially Worthwhile? COPYRIGHT © 2016- WEB X.0 MEDIA. ALL RIGHTS RESERVED. SHARING ACCESS IS NOT PERMITTED. REPRODUCTION WITHOUT EXPLICIT PERMISSION IS PROHIBITED.